The first MAMA’s House Tricerabration was held Saturday, June 19, 2010 in the backyard of our apartment on Winton Road. Thrown in celebration of the 17th anniversary of Jurassic Park, Tricerabration featured a cardboard welcome gate, three backyard games (ladderball, pterodactyl gliders, and “Pin the Party Horn on the T-Rex”), an impressive amount of food, four pitchers of mixed drinks, tiki torches, many inflatable dinosaurs, and over 20 guests. In short, it was a stegosaurical-success. We released a teaser trailer and a full trailer for Tricerabration in the months leading up to it, encouraged guests to RSVP to receive custom name badges on-site, and hung posters… in MAMA’s House and above the CITY Newspaper water coolor. What a marketing budget! 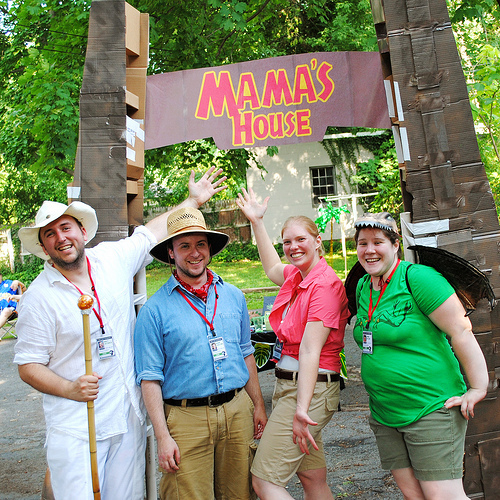 MAMA’s House welcomes you to Tricerabration! Recording audio for the trailers. Poster, VIP Badge, and the badge table.